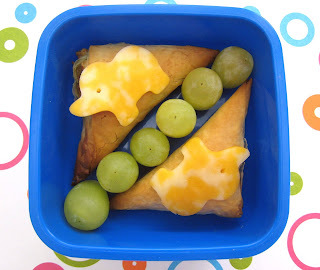 BentoLunch.net - What's for lunch at our house: Preschool Bento #50 - Simply Samosas! Preschool Bento #50 - Simply Samosas! Samosas have been on my want-to-make list for ages now. However, there are many many recipes online and I'm not exactly well-versed in Indian cuisine, especially not to decide which one looks good. Thankfully, my friend Robin came to the rescue and sent me a perfect recipe to try, made with yellow curry, potatoes, carrots & peas. They were quite the success with F&B and actually reminded me of an appetizer at our favorite Thai place. For snack today, Ben took two samosas, topped with an elephant piece of cheese (elephants are Indian, right? ), and a few grapes. Lots of veggies in the samosas, and the boy ate a huge bowl of watermelon right before preschool, so I'm not too worried about the low level of fruit today. Awww, this looks sooo cute AND yummy!!! I wondered if you could post your recipe for samosas. I have just been getting into Indian food, and would love to try and tried and true recipe. THANK YOU! I love reading your blog! I look forward to it each day! Adorable. I've never had Samosas but curry and veggies..yumm...sounds delightful! Sound divine...could you share the recipe, please? Yummy! The samosas and elephants look great! We have lots of Indian neighbors and I always smell amazing foods when I come home! The mother of two of Kidlet's buddies sends home delicious Indian food in exchange for fresh produce from our garden! Win! I posted the samosa recipe this morning. :o) Sorry, last night got away from me, I meant to do it then. Also added a box on the left with post tags, including a recipe one, hoping that helps too. cute cute cute!!!! PLEASE come cook at my house. Can't wait to try this recipe :) YUM!